I guess if the Padres are going to lose and get swept by the Dodgers, they may as well do it in the most crushing, embarassing way possible. Extra points if it’s in such a weird way that Sportscenter picks up the play to use a billion times. Without getting into the debate about what umpire Dale Scott did by waving his arms the way he did (clearly it’s the universal signal for deadball), it’s still crazy the the Padres, with men on 1st and 2nd and no out, found the one possible way to blow the rally in spectacular fashion. Anyways, Bud Black got kicked out of the game for arguing. 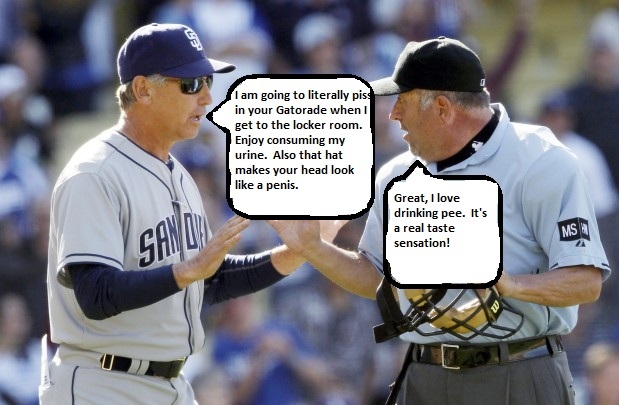 Padres Jagoff captured EXCLUSIVE dialogue with Bud and Dale Scott. In the end, Bud was the man. Like always. ← WHERE ARE LUCHA LIBRE TACOS IN PETCO?!?!?!?! ?